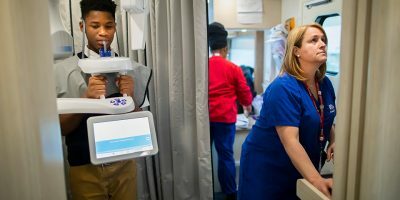 The PennSmiles mobile clinic features two dental chairs and is fully equipped to provide on-site care at community sites and schools throughout Philadelphia. Oral health education to children as well as parents. Dental screenings and referrals for dental care. Dental treatment on the PennSmiles dental van. The PennSmiles dental van, a mobile clinic of Penn Dental Medicine, is fully equipped for on-site care, featuring two dental chairs and all the necessary equipment for dental examinations, x-rays, cleanings, fluoride treatments, sealants, and basic dental fillings. The services offered on the PennSmiles van meet the same high standards of quality maintained in all of the Penn Dental Medicine clinics and are provided by experienced dental faculty and students. The University of Pennsylvania School of Dental Medicine also supports many community service projects, community outreach and volunteer work. If you are interested in having Penn Dental Medicine students participate in your community project or event, please download and complete the request form » and email it to sdmcoh@gmail.com, fax it to 215-573-9606.